Een handleiding zo dik als een telefoonboek, een uur (!) durende instructievideo en een dansende Bill Gates: de gekte van Windows 95. It was 20 years ago Monday that Bill Gates stood in front of a crowd at Microsoft’s Redmond, Washington headquarters and unveiled Windows 95. The iconic operating system introduced the world to the Start button, which would become a fixture on Windows operating systems until the introduction of Windows 8 in 2012. (Microsoft brought back the Start button this year with Windows 10). The company also hired comedian Jay Leno, who at the time was the host of “The Tonight Show with Jay Leno,” to help introduce Windows 95. Check out some highlights of the launch 20 years ago. Jay Leno helped introduce Windows 95. With that, the audience roared with laughter, according to a video showing highlights of the event. Bill Gates talked about the power of the computer to communicate with others. “Windows 95 makes it easier to deal with information,” a 39-year-old Bill Gates said in a video at the event. And for what could qualify as the understatement of the century, Gates talked about the power of using a computer to communicate with others. Windows 95 introduced us to the iconic Start button. The Start button, which remains part of Windows today, was a fixture of Windows 95. “Windows 95 is to computing what color TV was to black and white TV,” Steven Rudin, a computer consultant, told The New York Times right before he bought the CD at a CompUSA in Manhattan. Thousands of people tested Windows 95 before it went on sale. The image shows Larry Kurfiss, one of 50,000 testers, trying Windows before it became available to the general public. People around the world waited in line to buy the new operating system. It went on sale at midnight on August 24. This picture shows people in Singapore lined up at a shopping mall at midnight for a chance to buy Windows 95. People lined up to buy Windows 95 at a shop in New Zealand, the first part of the world that was able to purchase the new operating system on August 24. You had to buy the actual CD to get Windows 95. This is supposedly the first person in the world who bought Windows 95. Jonathan Prentice, a 19-year old from New Zealand, was supposedly the first person in the world to buy Windows 95. An 11-year-old from New Jersey was photographed while waiting in line to buy Windows 95 just after midnight on August 24. Stores opened at midnight so people could buy Windows 95 right when it went on sale. Pirated versions of Windows 95 were a big problem! Because the operating system came on CDs, software piracy was an issue. This is actually a pirated CD-Rom version of Windows 95, photographed in Beijing. Tons of people bought Windows 95 manuals before the August launch. And boy were they big. 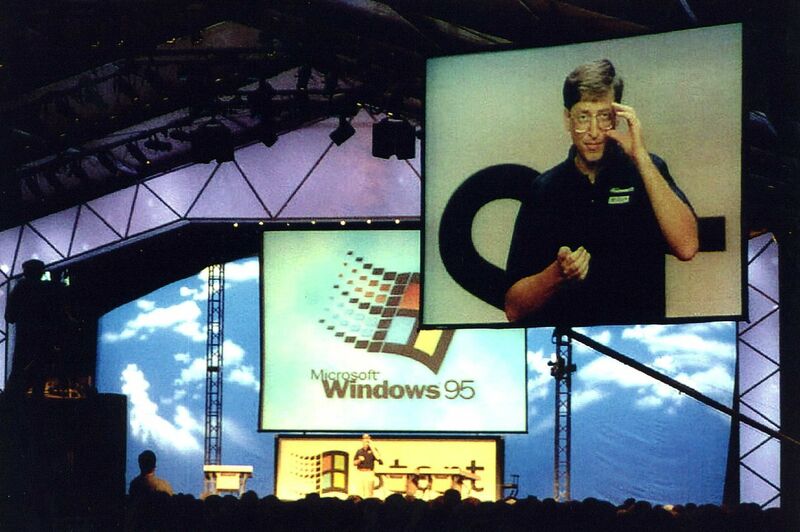 Check out these highlights from the launch of Windows 95. As an added bonus, Jennifer Aniston and Matthew Perry starred in a Windows 95 “cyber sitcom,” helping new users get acclimated to the system. Two of the biggest stars of the time starred in an hour-long video guide that came as part of a $19.95 instructional CD-ROM released in September of that year.